I'd love to propose to my county a solution! I teach a healthy aging class at the local parks and rec department that due in part to lack of marketing manpower the classes are being cancelled. I would like to reach the people who have a commitment to making small changes that offer real solutions and I would like to expand my reach beyond Ridgecrest. The series is affordable and provides some hands-on tools and resources that can change the destiny of our residents! We can change these heart disease, diabetes, and obesity stats when you partner with me (or similar professionals who advocate / educate quality and source), your health practitioner(s), and the county/state! If you know who I can talk to offer these workshops as part of a healthy workplace initiative, leave a comment with their contact information. I will be sure to let them know you referred me (if you'd like me to). The Power of the Plant! Plants do more than brighten a room, they are also good for your health. They promote clean air and help fight fatigue, stress, and headaches. If a house plant has this kind of power, imagine what phytonutrients from real food plants can do! 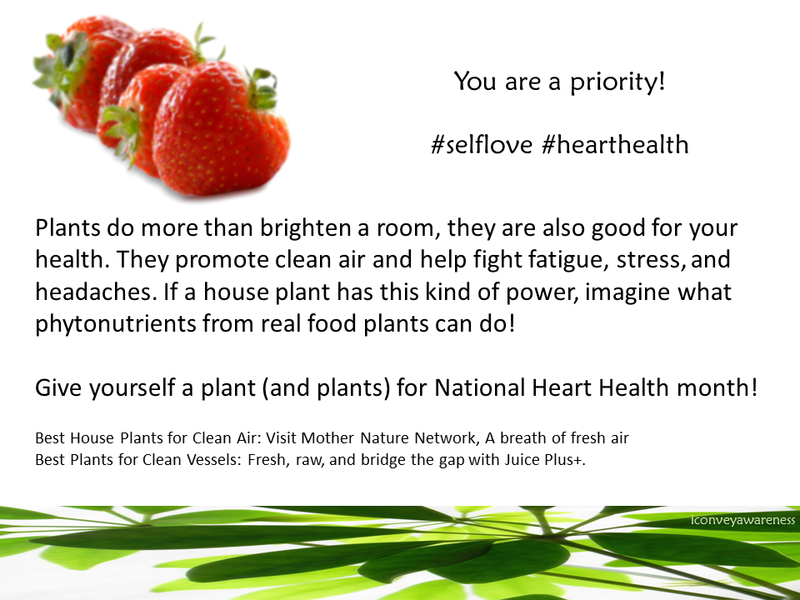 Give yourself a plant (and plants) for National Heart Health month! 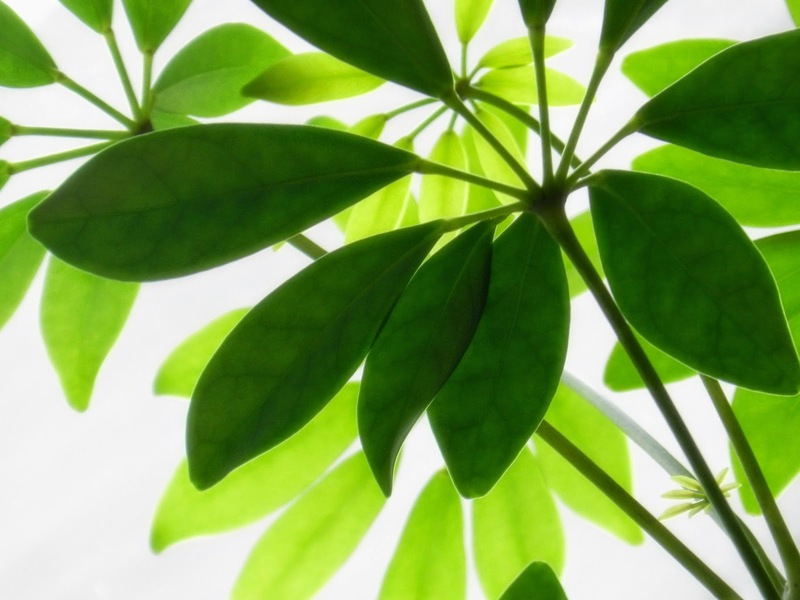 Best House Plants for Clean Air, visit A Breath of Fresh Air. Best Plants for Clean Vessels: Choose fresh, raw, and bridge the gap with 30 whole foods. What's all this talk about plants anyway? Everywhere you turn you hear folks touting the benefits of plants - both kinds, for your home and for your body. It's one of those topics that will never go away and the story doesn't change. It's time to embrace that plants promote healing. And if you're feeling inspired, grow a garden! You can grow a garden indoors and outside with this. Eat the real rainbow (colorful, a variety) of fruits and vegetables every day. Go beyond peas and carrots. Take it from America's favorite pediatrician, Dr. Bill Sears, where he talks the ABCs of nutrition for a healthy heart. I strongly feel that (real) food is the foundation to our wellness. I always look to food when I want to change how I feel - what to add in, what to reduce. And I listen to my body when I eat these foods to see if they align with my needs. I also keep a journal to record symptoms that are new or different than usual stuff. It's good to have a record if anything should happen, it'll be easier to identify some patterns. I also write goals to increase movement in my journal so that I can be proud of completing the good-for-me task! What steps will you take to increase cardiovascular wellness every day following this moment right now? 1). Add in more movement daily. 2). Be present in your thought process with regards to healthy lifestyle choices. 3). Make note of any unknown or unfamiliar symptoms and inform your practitioner. 4). Buy some plants to keep in your home to increase oxygen levels. 5). Eat more fruits and vegetables closest to their source. 6). Bridge the gap with the phytonutrients of 30 whole foods. 7). Register for (or request) a Prime Time Health workshop series. I love the tips that you shared. Such important info! Some plant maybe work, I try to make little garden by planting fruits on a pot and is really work. Great tips. I especially love #3 towards the bottom of the post! So important to mention anything new/strange when it comes to your health. I mentioned symptoms to three different doctors and still no one caught the kidney stone thing till it became obvious. I think people are afraid of sounding like a hypochondriac or finding out something is REALLY wrong. Great tips, Jessica. Thanks for sharing them at Savoring Saturdays. I've pinned this to our group board. Hope to see you back this weekend! Happy Valentine's Day! How fitting! Thank you so much for sharing Plants for Heart Health with us at the Healthy, Happy, Green and Natural Party Blog Hop. I'm pinning and sharing!